KIDS NEED TO GET DIRTY! Yes, sometimes it seems like kids these days could spend their lives glued to a screen if there was nothing to stop them. But your kids are keeping a dirty secret. Their little bodies and brains are inherently wired to play outside in the dirt. They need it, they crave it, and many kids are not getting enough of it. Kids need to get dirty. Immunologists are starting to urge parents to ease up on the antibacterial wipes and gels and let their kids spend more time outdoors. Studies have shown that friendly bacteria in soil may lead to serotonin production, enhancing feelings of wellbeing and could possibly reduce the risk of inflammatory diseases later in life. The American Heart Association recommends at least 60 minutes of moderate to rigorous activity for every child over the age of two. Outdoor activities are not only perfect for initiating physical activity, they are a great way to spend time together as a family away from the stresses of your family’s daily routines. 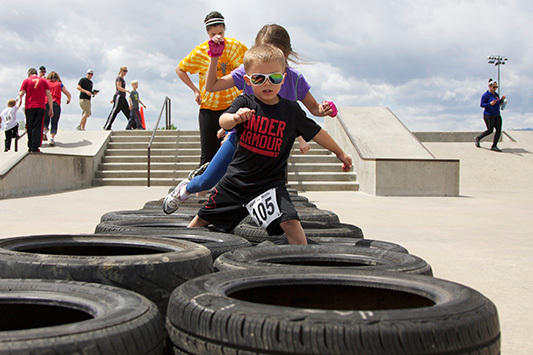 Come promote a healthy, active (and dirty) lifestyle with your family at Hard as Nails where we have a special 1k course designed especially for the kiddos. The best part about the course? They are guaranteed to get dirty!